Once you have placed your order our agent will give you a call to arrange a home visit to get photos, floor plans, measurements, description and an EPC (if one has been ordered). Once we have all the property details we will create the advert and email you a preview for your approval. Once you are completely happy the advert will go live on Rightmove, Zoopla and Primelocation. As a seller I can recommend esale. Their communication is excellent and I could always get hold of them easily if I had questions or for updates on progress. I saved about 75% on commission without any compromise on service. The service I was given by the very professional chaps at esales UK was of the highest order. Their knowledge of the marketplace was spot on. the price I paid was more than competitive and having paid upfront I had some reservations regarding their attention to detail. These were totally proved wrong and they did everything as promised. From putting my home on the market to completion was around 4 months. I can highly recommend esales UK and thank them very much for a job well done. We decided to use eSale mainly because of the great reviews on Trustpilot, and I am so glad that we did. They were always very professional, but also very friendly and reassuring. Mark “held my hand” from offer acceptance, right through to exchange, and I would have been lost without him (and Max). We were doing a long distance move to Wales which added to the stress, but it helped that I always felt that I could ring eSale, and ask for advice or guidance. Mark gave regular updates along the way, and although they had to chase our buyer quite a bit (an understatement! ), they got us there in the end. The fact that they are an online estate agent situated some distance away, did not affect the process one bit, and we cannot recommend them highly enough. Thank you again to Mark and the team. If you’re considering a ‘normal’ estate agent then don’t. These guys felt closer to the sale of our home than I could imagine any estate agent being and our buyers said they loved them so much that should one day they move on they are going to use them! Esale were recommended to me by my mum who used them to sell her home. And mum’s know best. Great company, got our property sold in the end and saved us several thousand pounds. Quality and friendly service. Would recommend. Absolutely excellent. Always efficient and honest. Good to have them on your side. Chose the upfront package – the whole process was smooth, efficient and communication was excellent. I will certainly us e-sale next time I sell a house. Esale were absolutely brilliant and very helpful, nothing to fault at all! I would recommend them to everyone selling a property! From instruction to completion Esale have delivered a professional and friendly service. They are always contactable and happy to sort out any queries always responding quickly. We saved thousands using ESALE and can’t recommend highly enough. This is a company that consistently go the extra mile and beyond. Fantastic service from beginning to end. I would use them again and will recommend them to others without hesitation. Five stars are not enough! From a buyers perspective, we felt incredibly looked after by Mark. He would regularly check in and was quick to update us on any developments. We felt that he looked after both ours and the vendors best interests in a friendly and professional manner. It made for a very smooth house buying process. Very good service with good communication throughout. Very good price as well. Esale provided a personal and immediate service. An initial hiccup with the description of the property was quickly remedied on request and then regular updates on progress provided. Mark was always efficiently involved with the sale and proved a friendly and well informed intermediary with all parties. Very impressive! Great service throughout the process. Very prompt and professional even when dealing with tight timescales and deadlines. A special mention to Mark for his assistance – much appreciated! Mark was amazing! I highly recommend him and esale. The whole process was made so easy. 5* in every way. Mark and his team were extremely professional and provided us with great service. I would highly recommend esale when you come to sell your house. Chose this firm after reading previous reviews and on value for money. From the first contact to the completion date, today, I cannot fault all the people I dealt with – namely Mark and Ryan especially and all others who treated me with respect and dealt with all my enquiries quickly and efficiently. I would wholeheartedly recommend ESale. Great service from start to finish, and saved me money! Would definitely use Esale again in the future. I have advertised three houses with esale, and I would happily use them again without hesitation. A friendly and professional service, open on Sundays (my local high street estate agents are not) and great feedback from my viewers on the service they provide to them too. What’s not to like?? Right from start to finish eSale have been fantastic. In spite of my reservation than an on line service might prove to be difficult to contact or that I might be unable to speak to a human being, my experience has been completely to the contrary. Mark (and Max) has kept in contact by phone regularly, chasing the sale and updating me on progress without my even having to ask. I find it extraordinary that high street estate agents remain in business if this is the sort of service you can access on line and I reckon I have saved myself a minimum of £2K in fees. Thank you eSale! Really happy using Esale, they made the sale of my house really easy. Very polite and helpful, would definitely recommend. Many thanks to Mark. Fantastic service from esale and especially Mark through what was a very difficult sale. Really went above and beyond to help me sell. Couldn’t recommend esale highly enough. Fantastic online estate agent. Great communication on all levels, from arranging viewings to giving feedback. Everything you would expect from a high street estate agent, at a fraction of the cost. I wouldn’t hesitate to recommend or use esale in the future. A big thanks to the esale team! Esale has been very good. The process has taken some time with buyers falling out due to mortgage problems etc, But the sale went ahead with esale continually pushing towards the sale. We paid upfront and I admit I was slightly concerned that they would sit back once they had received the money. However this was not the case and they acted very professionally throughout. I have never heard good things about estate agents and moving house. Although I cannot sing ESales praises enough! They have made the process a lot easier then I thought. They keep you updated every step of the way, they call you back when they say they will, they are very understanding of your needs and any questions they go above and beyond to find out the answers for you! 100% recommended! Lovley people to do business with. Our house sold within a week. Esale kept us updated and informed. Excellent photos and description. We saved 4k plus. Highly recommended. Easiest five stars I have ever given in a review. Esale were professional and friendly from the first contact I had with them right through to completion. The photographs and description were excellent and completed very quickly, we were live within a few days and had an offer in two weeks. traditional estate agents tried to suggest the service from an online agent would not be as good; our experience was quite the opposite, communication was excellent, they made sure the sale went smoothly and were proactive at every stage. The only difference was they saved me about £2000. Absolutely no reservation about recommending them. Esale were excellent, Great communication and hassle free plus great value for money. I found esale by reading up trust pilot reviews and found my experience to match many of the excellent reviews they have had. What’s great about them is that the cost option is clear with no hidden extras (unlike a lot of other online agents), and you get the service of a high street agent for so much less of the cost. Any time I called the office I had someone answer who knew me and my property, I wasn’t just another person on their database. I had quite a difficult chain so they really did earn there money with constant chasing and updating everyone involved. Go with them, you won’t be disappointed in the service they offer and if I ever sell again they’ll be who I use. Highly recommend very professional and helped us to get the price we needed for our old house to buy our dream home. Fees were fraction of the cost quoted by other estate agents and Mark and the team were extremely helpful. My first experience with an online Estate Agent. I can honestly say that the ESale team have been professional, efficient and courteous above and beyond what I have come to expect from the normal high street agent. They are a pleasure to deal with, make immediate updates, provide advice, and seek feedback within 24-hours. I highly recommend this online Estate Agent to anyone. Brilliant service from start to finish. I was always keept up to date at every stage of the process. Completely stress free and highly efficient, 6 weeks start to finish! I would definitely be recommending eSale to anyone I know who is thinking of selling. eSale were efficient, helpful, friendly and professional. They were easy to get hold of by email and phone and responded quickly to any messages we left. They quickly sorted out any problems we encountered. We would definitely recommend eSale. Mark and Dave make the process so straightforward and stress free. This is the second time we have used Esale and the entire transaction was completed in 10 weeks! The house sold in a day, completion was delayed due to other party’s solicitor. Can’t recommend Esale highly enough! Best estate agents in the UK! – We shopped around an awful lot before picking our estate agent, looking at both high street ones and other online agents – House Simple and Purple Bricks, however decided on Esale. Now just because they are an online agent doesn’t mean they act like one, In fact from our experience they were more personable and ‘real’ than high street agents. We loved the fact that if you ring up you can speak to a number of people and they will all be able to manage your file, but not only that they are a small team and you get to know them over the phone. 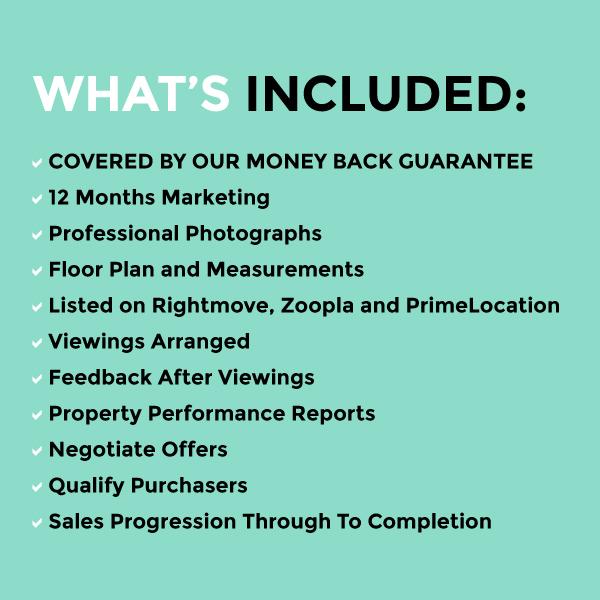 Once you have sold your property Mark managed the whole of the sales progression process. We had a rocky time but only because of some awful solicitors further up the chain. Mark not only communicated very well with our buyer but put our minds at ease at this end of chain! And sometimes even just listened to me whilst I moaned about our sellers solicitors. If I ever decided to move again I would only pick one estate agent and that would be these guys. Real people, without the bullsh*t, 100% commitment to selling your home and doing everything possible to push the sale over the line as quickly as possible. Plus they charge a reasonable amount! Outstanding service from E Sale, they made the whole service stress free and very professional. I will definitely use them again. I picked eSale as they had just sold a neighbouring house without hitch and they offer a one month money back guarantee, so lower risk if they weren’t up to the job. They were definitely up to the job. Photos, listings, drafts, sign board etc. were all done in a week and we were live on the websites. Four weeks later an offer was in, ‘Sold’ appeared on the board next morning, job done. But it wasn’t. Despite a tiny chain of three, the bottom house messed us all about for weeks, eventually dropping off and being replaced by another buyer. This is where an estate agent earns his money- chasing, investigating, advising. My man at eSale was Mark, who did a far more effective job of keeping me informed and advised than the other three “full fee” agents in the chain could manage for their clients. We nicknamed him Columbo as he liaised with all parties, went far further down the chain than he needed to get us the facts and helped us make the appropriate decisions. I recommend him to everybody, buyer or seller, and I would definitely not be going anywhere else for an agent. Very professional, great service all the way through, helped a lot with issues that appeared on the way. I’m so glad we chose eSale to sell our house, their service was excellent from start to finish, at a very reasonable price. There’s not really much more to say except that we would recommend them to anyone and everyone. Thank you eSale. Very good company, extremely efficient and informative all the way thru my sale, I would recommend and already have done to others. eSale demonstrate excellent customer service – they have a friendly disposition and are always willing to help. They are proactive and responsive; they helped to move my property through from viewings to sale to completion. They offer superb value for money. Would I use them again? Most definitely! I am confident in giving eSale a 5 star rating, and would certainly recommend them to anyone looking for an online agency. I chose them after a long internet search and have not been disappointed. Their communication with me has been excellent (and unfailingly friendly) I was selling a retirement flat in a very slow market. I would definitely use them again with confidence. I was a little dubious at first about using an online agent to sell my house, but after some research and comparisons I decided to give esale a try. The esale team gave a very professional, polite and friendly service from start to finish. House sold, no commission, great! Great estate agent! They dealt with my property from start to finish and kept me informed throughout. There are no hidden fees and amendments to listings where always changed promptly. I highly recommend them and would certainly use them again in the future! Cannot praise them enough. Very professional from start to finish. Knowedgeable staff who were always at hand to help with any queries. The solicitors which they recommended were first class, at each key stage they sent you an email saying it was complete and never had to meet them once. The bottom line is though, that they were great value for money and saved me thousands, compared to if I had sold through a local estate agent. Would highly recommend them with nothing to fear. We chose eSale having read great reviews about them and have not been disappointed. Our house sold to the first viewer they sent round and we’ve now just completed. It wasn’t all plain sailing; several curve balls were sent our way but eSale took it all in their stride, offered sound advice and got us through it with the minimum amount of fuss. I have already recommended them to people I know. Thanks Mark and team, you were a huge help. Great service from the whole Esale team!! Would highly recommend!! Mark was excellent whenever we communicated. Would recommend him. Great service, always there to help push the sale along. Would recommend without hesitation. Dealing with Esale was the best experience I have had with an estate agent. They guided us through the whole process from initial instruction through to completion and the level of communication from them throughout was second to none. Esale are not like other online estate agents, they offer high street service and knowledge at online prices. Why would you use anyone else…? We’ve been buying a house through eSale and they’ve been great to deal with throughout, particularly in keeping us updated with any developments, however small, throughout the process. The whole team have been helpful whenever I’ve called. Can’t fault them. I have sold five properties with either House Simple or Emoov in the last 18 months but I was looking for an alternative. After researching the market, looking at reviews on TrustPilot and chatting to esale, I decided to give esale my next house sale. The house has just sold so my feedback is based on the whole transaction experience. What particularly appealed is they remain relatively small in the online market so can provide a personal service- something the bigger players can not do. Quick to answer the phone, friendly, efficient service and a pleasure to deal with. I was tempted not to give any feedback as I don’t want too many people using them and their small, personal business model changes as a result! But I do highly recommend esale, and have used them again for another house sale! Our property was on the market for one day and it sold, esale were brilliant from start to finish. Very helpful and kept us updated regularly throughout the process. They saved us a lot compared to a traditional estate agent in sale fees and provided the same service. I would definitely recommend and use esale again in the future. Once again an excellent service from this company. I would have no hesitation in recommending them to anyone. Friends have used other ,well known, Internet agents and have been disappointed. E Sale are professional, efficient and offer a personal service. This will be the second time I have used E Sale and should there be a need I would ,without doubt ,use them again. My home was no easy Sale but the team worked hard with my Solicitor and my family to ensure we eventually secured a Sale. My next door neighbours are now selling their property with E Sale… Thank you to the team for all your hard work, you have made, what might have been, a nightmare into a successful Sale. Very good service, kept things moving along smoothly. Online estate agents for house sales seems to be the way forward as more search on the internet for a house and we achieved plenty of interest which resulted in a sale. First class service. As good as ANY Estate Agent on the High Street. They were there for me every step of the way. I have no hesitation in recommending E-SALE to anyone wishing to sell their property. You WILL save literally thousand of pounds on commission as I and many others have. Recently appointed ESale for the sale of an apartment. It wasn’t an issue that the office is no-where near where I live. Called ahead with a few questions and talked through how it works. The advert went live within a week which included having the photos taken and the advert approved by me. Had two viewings booked for the day after going ‘live’ and received asking price offer same day. Excellent from start to finish. Always available on the telephone, would call back when they said they would. Always chased if I asked them too and overall lovely to deal with. Personally, I don’t know why you would even consider using a high street agent. Excellent value for money and I have been, and will continue to recommend. Excellent as always. The 4th property I have sold through Esale in the last 2 years and hopefully I will send many more their way! I would like to thank all the team at esale for a top class service. Sold our bungalow with in 12 hours. Very helpful always there to help and answer the phone even on a Sunday. I saved in the region of £3,000+ . Thank you to all the team at esale. I didn’t imagine I’d ever find it necessary to leave an estate agent review as a purchaser, but I didn’t want my experience with esale to pass by unrecorded. they were thorough, pro-active and helpful in every possible way, doing whatever was necessary to remedy any issue I called with, speedily and effectively. they could not have done more. It has never occurred to me before that estate agents can make a positive difference to property buying, throughout the whole process, for the purchaser as well as the seller, probably because until now – from my point of view – they never have. At best I thought I would hear no more once my offer was accepted. I am happy to admit I could not have been more wrong. It seems to me that esale offer an all-round service which keeps everybody happy and I wouldn’t hesitate to use them if I was selling a property. In this day and age, there is literally no need to use a ‘traditional high-street estate agent’ which charges an extortionate fee and do very little. A high-street estate agent will tell you all kind of stores about online estate agents but they’re simply not true, not with Esale anyway. I’ve nothing but good things to say about them… and I did ALOT of homework before appointing them. Esale are with you from the moment you appoint them to the moment you complete the sale of your property. If you’re still unsure, give them a call & ask as many questions as you want in order to give yourself confidence in their services. Save yourself some time, money, effort & possibly most importantly, stress, by using Esale. Online estate agents are the way forward, and Esale are the ones to choose! In this day and age, there is literally no need to use a ‘traditional high-street estate agent’ which charges an extortionate fee and do very little. A high-street estate agent will tell you all kind of stores about online estate agents but they’re simply not true, not with Esale anyway. I’ve nothing but good things to say about them… and I did A LOT of homework before appointing them. Esale are with you from the moment you appoint them to the moment you complete the sale of your property. If you’re still unsure, give them a call & ask as many questions as you want in order to give yourself confidence in their services. Esale gave an amazing service and I would not hesitate recommending them to anyone. No matter which member of their team you speak to, they are always helpful and professional. Mark helped sell my property twice after it fell through the first time and Kirsty and Dave proved invaluable when it came to helping me secure my new property. They were also able to recommend a solicitor who have also made the whole experience much easier and less stressful. The fees charged are significantly lower than traditional agents but this does not mean in any way that you get any less of a service. Having spoken to some other agents when deciding to put my house on the market, and after trying to arrange viewings it is clear to me that the service received by Esale is actually superior to other agents. Previously, my partner and I would have been hesitant about using an online agent but with them being based in my home town we gave them a go and am so glad we did. Speaking to them on the phone and via email is just as efficient as going into fancy offices but without the higher cost. Mark and the team communicated well throughout the process. Great value, I would definitely recommend eSale to a friend. Esale provide an excellent personal and friendly service; there is always someone available to discuss matters with and they are quick to provide feedback from viewers. Their sales particulars contain detailed property descriptions and professional photography and all staff are knowledgeable about the properties they are selling. They sold my house at a fraction of the cost of most high street agents. Brilliant service and speed of sale. Property had been on market with conventional agents for a considerable time with no results. Esales sold the property in less than 4 weeks. Excellent in every department – communication, understanding, advice, knowledge, feedback. Just an all-round excellent package. No need to waste your time and money on anyone else, just contact these guys and you’ll be impressed from the get go. Mark was very professional and always at the end of the phone or emailing with up dates I would recommend the company to anyone. Best estate agents by far mark who dealt with are sale was so helpful always ringing passing on updates and anyways answered are calls or got back to are messages I will definitely be recommending this company. If there was extra stars I would certainly give them more 5+stars all the way. Fantastic from start to finish. Sold our property very quick. I appointed Esale having had a recommendation from my dad who had sold a couple of properties with them. I couldn’t have made a better decision, they were fantastic throughout the whole process! I was forced into selling my house due to a separation and Esale made what was a difficult time personally as easy as they possibly could for me. From the moment I appointed them right through to handing over the keys they were in regular contact with me not only with viewing appointments but also with assistance during the conveyancing process. I can confidently say they showed a real interest in getting my house sold, even though I’d already paid them upfront! Dealing with Esale has been a pleasure from start to finish. Such an easy way to sell your house hassle free and at a great price. They were always on hand to answer my queries and dealt with everything quickly and efficiently. I will be recommending Esale to all my friends and family. This is the second house I have sold with Esale. Just as happy with the great service I received once again. Keep the good work up guys! I was absolutely delighted with the excellent service I received from esale. I can’t fault this company and I would recommend them to anyone! Esale saved me over £3000 in normal estate agency fees. The service was quick,efficient and professional from start to completion. A complete estate agency package for a fraction of the high street prices backed up by a money back guarantee, what more could you need! Great service from the start of the process to the end of the process and successful sale of our property. eSale have provided a great service throughout. Mark, Dave and everyone I’ve dealt with have been nothing but helpful and I would recommend eSale to anyone looking to sell their home! I ummed and ahhed for a long time about whether to choose an e estate agent or not. This was definitely a good choice. Mark kept me informed all the way to completion and was friendly, knowledgeable and supportive through stressful times. My property sold to the first person that viewed at above the asking price so I couldn’t have asked for more. Thank you eSale and thank you Mark. A fantastic service. Esale have a superb communication network in place. All staff were knowledgeable, committed, efficient and extremely accommodating throughout the entire process. Great photographs and marketing. Masses of viewings organised through the company. The cost of the service provided was unbelievably good value when I consider how hard Mark and the team worked to achieve a successful outcome. There is no hidden agenda or additional costs. 5 stars without reservation! A brilliant job all round, kept me informed from start to finish, organised all the viewing’s and sent a txt to confirm and gave me feedback on any comments given from buyers, Plus all for a fraction of the cost of a high street estate agent. If i move again in the future i will definitely use them again. The packages offered by Esale are brilliant, we went for the one off, up front payment and were not disappointed. The service we received from Kirsi in Harrogate was second to none. They were always on hand, so helpful, friendly and professional. They took a huge amount of stress out of the selling/moving experience. Thank you Esale! Kept us up to date every step of the way. Easy to get hold of with the smallest questions. Polite, professional and friendly. I was over the moon with the service I received from Esale. From offer to exchange the service I received was exemplary. As an ex estate agent myself albeit some time ago, I knew how I used to work and what I expected. I have also had experience with purple bricks who were shockingly bad, so my expectations for Esale were actually very low! However they totally surpassed my expectations and were an absolute pleasure to deal. Wonderful 5 star service, couldn’t ask for better. Highly professional, efficient and friendly plus very reasonably priced. Estate Agency doesn’t get better than this. Everyone I spoke to at Esales were great. All calls were returned promptly (sometimes after working hours which was really helpful). Nothing was too much trouble. The help I got pushing the sale through was really brilliant and I would recommend them to anyone wanting to sell their house. I was delighted with the service I received from esale. They arranged viewings quickly and I put an offer in that day. They kept me informed of the process throughout , more so than my solicitor. They were professional and also gave a personal service. I would highly recommend them . We were initially worried about the idea of using an online agent but after doing our research we opted to go with esale – partly because the feedback on here was so good and also after speaking to them we felt they were a good choice. Plus, the risk was lowered because of the money back offer, so it felt safer to try out a different approach to selling our house. …and we were not disappointed and had a fantastic service throughout. Our house sold in less than a week and on the first viewing! All the staff were friendly and helpful and the property was well marketed. Thank you for all your support! During the whole purchase process Mark took the time to make sure we were fully informed at all stages as to the progress, and we were most impressed with his professional approach and in depth knowledge throughout our time of dealing with him. You cannot go wrong, use a high street agent pay £000’s and end up on Rightmove, Zoopla and the other Property Search Engines. Pay eSale a fraction and end up on the same search engines. Still have a professional take the photos, still have the Agent chase the various parties during the transaction process. It really will become a no brainer in the future, I am sure a decade ago we always thought Woolworths be on the high street too. We had tried several more ‘traditional’ high street estate agents in regard to selling our (admittedly tricky, – bungalow with a steep drive) with no joy so decided our sale was very much going to come down to the ‘right’ person finding it. That we decided was most likely to be on-line so why use a high street agent and pay £000’s in fees? We decided on Esale and found they did exactly what they were supposed to and though our property did have many viewings before an offer and sale eventually happened, their part in the process was painless. Esale Harrogate were the agents acting for the seller of the new apartment we have just purchased. As the Leasehold was none standard the purchase was rather difficult and lengthy. However, even though Esale was not acting directly for us they provided us as buyers with excellent communications and support throughout the whole process. As deadlines approached they stepped in to ensure all parties were communicating effectively to push the purchase over the line. Excellent service all the way though, nothing was too much trouble, all the help I needed was never more than a phone call away. The only way to sell a house nowadays – fantastic service, great photos, easy communications. Saved a load as well. Thoroughly recommended. Great to deal with, very efficient. No hassle – highly recommended. I found E-Sale to be a very efficient, professional and cost-effective service. They know the ins and outs of the business and are always on hand to help with any technical queries. Some might worry that they seem so cheap that they can’t be value, but I can assure you, as a very satisfied customer, that this is not the case. They earn every penny and more, and if I sell again, I will be going directly to E-Sale. I used Esale to sell my property in Rochester. I received 10 viewings in a week, and 7 offers. He helped me with the negotiation throughout. We will exchange soon. The whole process was quick and efficient. I would recommend them to anyone who is looking to sell, and wants to save money without compromising on customer service. Excellent. Third time I have sold a house with Esale and I am always very pleased with the service they provide. Very, very good customer service, very informative, very helpful. Will definitely recommend to anyone- will definitely use in the future if need to. Cannot rate how good they are at answering the phones, getting in contact with you enough! A Professional service from start to finish. This company have delivered every component of their package in selling my property, and they deserve credibility for doing so. A massive recommendation from myself and my family. super team always helpful and will never understand why people would want to pay three + times as much for the high street service that wont be as good as Esale. They did everything it says on the tin and much more. Esale if I could I would give you 10 Stars. I will be recommending Esale to everyone I know. The customer service was above and beyone my expectations. Everyone was friendly, helpful and polite – if you are selling your house try Esale you will not regret it. Sold my house with esale within 5 days of going on the market!! A very professional company a 5 star service without the 5 star cost, I saved around 10k on fees!! Would definitely recommend them to anyone and would certainly use them again. Thanks esale. Exceeded all expectations about on line selling. The guys at esale did an amazing job selling the flat in four days. They are incredible value for what they charge compared to High Street agents. They kept in touch and on top of things throughout the process. A big thank you. Very good service and excellent feedback. Would recommend this estate agent to anyone the service was 100%. Esale has to be the ‘go to’ firm for anyone wanting to sell (or buy) a property in today’s crazy housing market, no matter where in the country you live. We enjoyed first rate professional service from first contact through to completion on the sale of our house. Their fees represent incredible value for money. We would certainly use esale again if we ever come to sell. A big thanks to everyone at esale for what they did for us. Very hard working for a sale, lots of viewings and would recommend them to anyone who has a property to sell. Very professional service. Great people to deal with who kept me up to date with progress throughout. Would recommend esale to anyone. Esale provided a fantastic service and I was able to sell my home in 5 days for a fraction of what the high street agents wanted to charge. They were professional and courteous and handled every aspect of the sale in a timely manner. We were impressed by the trouble taken to keep our purchase on track. On-line estate agents are the future. And eSale are Brilliant!!! They kept us informed every step of the way. They chased up buyers and solicitors and did everything to ensure a smooth sale. Yes, we showed viewers around. Yes, we handed the keys over to the buyer. Yes we saved £3600 in fees. Thank you eSale, we will use you again. Defiantly!! Used Esale on the recommendation of a friend. And I have not been disappointed! Right from the beginning I felt I was an important customer. Mark and Dave (yes first name basis – which I like) have kept me up to date with every step of selling my house. They are friendly but professional, informative and helpful. From start to finish esale did a great job. They took care of all the marketing, photos and viewing for us. The property was on line and the for sale board up within 24 hours. The best move I could have made after deciding to sell! I really didn’t want to throw money at a high street estate agent but I wanted the best chance of selling my house. When I found Esale I found my solution. Ever since then I’ve been telling my family and friends about Esale. The whole process was so reliable and of top quality. The guys in the office are professional and friendly always answering all my questions confidently and keeping me up to date. Nothing was any trouble and I always felt reassured. Esale made my house selling experience less stressful and I saved myself a fortune. I will use them again every time. I wish them continued success. We cannot praise esale enough. From the moment we saw their website, which was very easy to understand to our first phone call. Within 2 days of phoning them they had arranged a photographer to take photos of inside and out. The price also included the EPC and it went on Rightmove plus a sign went up. During the process of selling, they kept in touch with us, our solicitor and the buyers solicitor and helped smooth the way. We cannot thank them enough for helping us to sell our house. We would recommend everyone to use them. A friend initially recommended esale to me following an exceptionally quick sale of her house. The initial attraction was the potential savings I could achieve but I did wonder if the level of service would be less – this was NOT the case. They were always there on the end of the phone advising on progress and helping to push the sale through – I certainly had good value for money. Customer service from esale could not be faulted and was over and beyond anything I expected, with regular updates and quick responses to all my inquiries and requests. Their commitment to customer service is second to none and I would have no hesitation in recommending their services to anyone selling a property – you will not be disappointed. I had fabulous service from Mark who gave me advice which he wasn’t paid for. I can’t recommend ESale highly enough and would never use a ‘conventional’ estate agent again. Esale worked very hard throughout the sale of our property, from getting the property details set to dealing with very frustrating solicitors. All for a fraction of the price of traditional high street estate agents. We saved £1500. The property went onto Rightmove within days and I sold to the first person. Whilst the property was in the process of being sold I had further enquiries to view which E Sales recorded should the sale fall through. All in all a brilliant service. The service I received from E Sale was first rate. I found them to be efficient, friendly and professional at all times. We sold our property within 10 days of marketing and saved ourselves several thousand pounds in the process. I would not hesitate in recommending them to anyone selling their property. House sold in 4 days, the whole sale went through very smoothly. What an excellent service e sale provided. Mark and the team made our move possible from start to finish always at the end of the phone to advice us on how we could move the sale//purchase forward. Very knowledgeable and knew exactly what to do with any any issues that needed to be resolved. It was stressful but would have been more so without their expertise. We feel that the one stroke of luck we had was choosing them to support us with the journey to our new home.so anybody out there who wants to move house give e sale a ring you are guaranteed not to be disappointed. Great customer service for a fraction of the cost of a traditional estate agent. We were regularly up dated and kept informed, we’ll definitely be using Esale again in the near future. I found esale to be much easier to deal with than your conventional estate agent and, saved myself a whole lot of precious money. We were very pleased with the service provided by the esale team & saved a lot of money as a result of not using a traditional high street estate agent. The online details & photos were professional & the ‘For Sale’ board was in place as soon as the details went live online. We had viewings from day one & sold the house in 6 days for the full asking price. Despite the nightmare delays caused by poor solicitors Mark and David bent over backwards to provide as much support as they could to make the sale of my property a success. Their efforts went above and beyond expectations and I am grateful for their assistance. Many thanks guys. I highly recommend e-sale. For what I paid, the benefits I receive were well worth it. Even after they had received their money up front, they kept in touch and were genuinely concerned to see my property through to completion. This is the future of house selling. Esale have been extremely helpful. They go the extra mile and always bend over backwards to offer great service especially Tim! I would definitely recommend everyone to use them. 1st Class! I was recommended this company by a friend and I was unsure at first as I have always used the usual estate agents in the past, but decided to give them a go. Best decision I have made! Sold within 4 weeks and cannot fault the service, staff were always happy to help and planned my viewings really well. I would suggest this agent to others. Esale sold my house quickly and with no fuss. The guys in the office were very helpful and their prices were excellent. I will be recommending them to friends. The service we received from esale was first class. I would have no hesitation in recommending them to anyone wanting to sell their house and I will be using them again. Use these guys if you want to save on unnecessary fees. Very helpful and easy to use service. Appreciate the fact I didn’t have to deal with real Estate Agents. Decided to sell one of my properties but wanted to try an online agent to save myself a great deal in fees, do not regret this decision as I had my property sold within 2 weeks. Super people to deal with, will be using again and would highly recommend. We decided to give esale a try as we wanted to sell our house. The whole process was very easy from start to finish. The staff in the office were always willing to offer advice and help. They found a buyer for our property in just a few weeks and we ended up completing on our sale in good time with no complications. We also saved a substantial amount of money by using an online estate agent. I would highly recommend esale to anyone who has a property to sell. Fantastic Customer Service. Hassle Free. Highly recommend. Very good valuation. Great property write up. Super at dealing with offers and advising. Hassle free sale of my property with excellent customer service at a very reasonable price. I would highly recommend and use again in the future. I found the staff at esale to be very helpful and professional. They were always at the end of the phone and happy to answer any questions. They helped me through the whole selling process and nothing was too much trouble. I would definitely recommend them to anyone. Thanks guys. Very friendly & helpful, would highly recommend. Always on the ball & very friendly, would defiantly use again! We decided to use Esale to offer our house for sale as they offered the most competitive terms and were extremely professional and supportive. The perceived issue and barrier of using an internet based agent over a high street agent was removed immediately and the service received throughout the sale was excellent. Highly recommended. I was apprehensive at first about using an online estate agent but after speaking with David in the office I decided to give it a try. The service was first class, they sold my property within a few weeks and kept me informed every step of the way. I saved lot of money in estate agent fees and would have no hesitation in using the esale team again.